Ajith will soon be seen in the spy-thriller ‘Vivegam’. Ajith Kumar is undoubtedly one of the biggest stars in Kollywood today. During his highly illustrious career, ‘Thala—as fans like to call him— has won the love of movie buffs thanks to his stylish personality, good looks and effective performances. Furthermore, he has delivered quite a few hits at the box office and proved that he is a synonym for commercial success. Now, the much-loved superstar is in the limelight for an awesome reason. As it so happens, a photo of Ajith is going viral and that too for all the right reasons. In it, Thala can be seen spending some quality time with his family members. 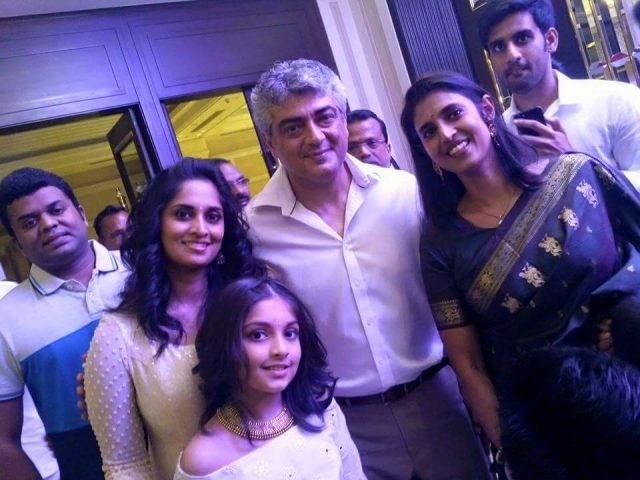 And, it goes without saying, Ajith seems to be enjoying the occasion to the fullest and looks quite happy here. Interestingly, actress Kasthuri too can be seen here. She too seems to be in a good mood. Given Ajith’s popularity amongst fans, this pic is bound to send movie buffs into a state of frenzy. Now, that’s what we call a priceless snap! On a related note, this is a busy time for Ajith. He will soon be seen in the much-hyped ‘Vivegam’. Touted to be a spy-thriller, it has become the talk of the town thanks to its gripping teaser. Besides Ajith, the film also features Kajal Aggarwal and Akshara Haasan in the lead. This will be Ajith’s first release of the year. He was last seen in ‘Vedalam’. Released in 2015, it was an action-drama and also featured Shruti Haasan in the lead. Why is he looking like all of their great grandfather?